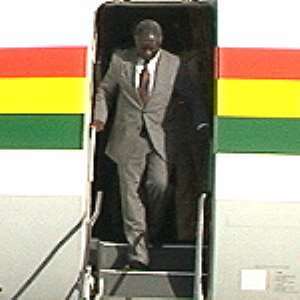 Accra, June 13, GNA - President John Agyekum Kufuor arrived in Accra this evening from the United States where he attended the G8 Summit. Nana Akufo-Addo, Foreign Minister and Mr Kwabena Agyepong, Press Secretary to the President accompanied him on the trip. Briefing journalists on the highlight of the meeting Nana Akufo-Addo said the invitation to the six African leaders to the Summit was to bring African concerns to the world's richest nations. He said the discussion with the G8 leaders centred on peace keeping in Africa, economic development, the HIV/AIDS pandemic and agricultural development. Nana Akufo-Addo said the President held separate bilateral meetings with President Jacques Chirac of France and President George Bush of the US on issues of development and economic assistance to Ghana. The Foreign Minister said the meeting was successful for it created a platform to promote dialogue between Africa and the G8 countries. Nana Akufo-Addo said the President also met with the US Secretary of State Collin Powell during which they discussed issues bordering on the sub-region, ECOWAS and the need to assist in effort to bring peace to the region. He said President Kufuor also represented Ghana at the Funeral of the late American President Ronald Reagan. The Foreign Minister said the President instructed Ghana's Ambassador to the United Nations, as well as Ghana's High Commissioner in London to invite international observers to Ghana to monitor the Presidential and Parliamentary elections in December. He said this was to prove to the world that Ghana's democracy had come off age. Vice President Aliu Mahama, some Ministers of State, the Inspector General of Police, Nana Owusu Nsiah, Chief of Defence Staff, Lt General Seth Obeng and the US Ambassador Marylyn Yates met President Kufuor on arrival.